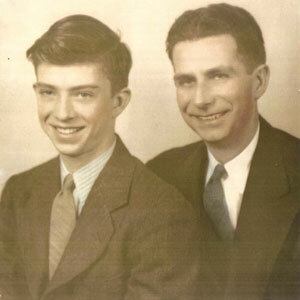 Jim and William (brothers) in May of 1942. William Rutherford Claybourn was born 22 September 1906 in Evansville, Indiana. He graduated from Reitz High School in 1924 and went to work almost immediately for Howell Bank. William married on 3 February 1931 to Colice Lorene Piper of Evansville (born 22 December 1907). Lorene was called “Rene” by the family but “Susie” by her husband and friends. The two lived at 2901 Igleheart Road in Evansville, Indiana. Later he worked for the north side branch of Howell Bank, which merged with Old National Bank in 1951. He was manager of Old National’s east side office in November of 1953. In 1958, as a Vice President, he was named to manage the bank’s new branch office in a rapidly growing commercial area at 2230 U.S. 41 North at Diamond Avenue. William was a 32nd degree Scottish Rite Mason (of Reed Lodge No. 316 of Free & Accepted Masons), President of the Hadi Shrine Temple in 1944, and Potentate of the Hadi Shrine Temple in 1956. He received the Fez at the Potentate’s Ball on 3 February 1956, on his 25th wedding anniversary. He was a member of the Rolling Hills Country Club, the North Side Kiwanis Club, one of the original members of the North Side Businessmen’s Association, and the Cumberland Presbyterian Church (of which he was treasurer in 1959). In January of 1959 he was appointed to the Metropolitan Plan Commission and the Evansville City Zoning Appeals Board by then-mayor Bill Davidson. He was a member of the Bank Auditor’s and Comptroller’s Association and the National Office Manager’s Association. On 10 December 1964 William was westbound on Delaware street in Evansville and attempted to turn left onto St. Joseph Avenue when he apparently suffered a heart attack and lost control of his car. He swerved left of the center line and hit a car stopped at the intersection for a red light, continued down the street and struck a second car which was also stopped in a line of traffic. According to the officer on the scene William did not want to go to the hospital because it would upset his wife. However he eventually relented and, two hours after the heart attack, William died at the hospital. His physician attributed his death to the heart attack and not the car wreck. Overcome with grief and despair from William’s death, Lorene took her own life some months later on 10 July 1965 by turning on her car in a closed garage; the carbon monoxide poisoning eventually took her life.